The push is running this week in both cities. PHOENIX, AZ: New Yorkers and Chicagoans may still be stuck in the winter of their discontent, but at least they’ll get a ray of sunshine this week, courtesy of Arizona. The state’s office of tourism is sending items from care packages to travel vouchers to the frigid markets to drive awareness of its brand as "the sunniest state in the U.S." with 313 days of sunshine on average per year. A discovery team is also mining dreary Instagram and Twitter accounts of New York and Chicago residents for posts with winter-related hashtags. Then it’s reaching out with comments, direct messages, or even memes, said Scott Dunn, senior director of content and communications at the Arizona office of tourism. He added that the tourism division’s strategy is to create personal interactions with residents of the two cities, saying, "If someone has a dog that is cold, we send them a dog jacket for winter or paw booties." "One post [on Monday] was about someone staying in bed eating Pringles and drinking Coke, so we sent them a delivered meal," he added. "The sunshine we deliver is based on the personal needs of the person having issues with winter." 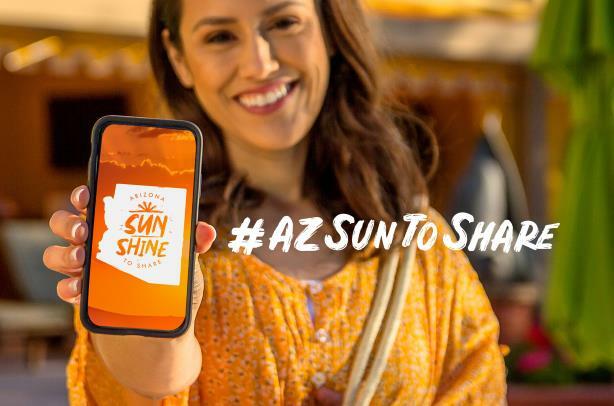 The tourism office has also stocked up on natural light therapy lamps, hand warmers, heaters, Navajo blankets, and more to send to participants, and it is conducting giveaways for resort and spa stays, as well as tickets for Spring Training 2020 games. The tourism office will also explore partnerships with airlines for giveaway winners. Weather-based campaigns can be risky. The effort was set to launch a week ago, but Arizona received a dusting of snow, so the office delayed the push while waiting for normal weather. The tourism office also wanted to plan around the risk of an extreme weather event, like the polar vortex that left 21 people dead this year. "You have to be mindful of how bad some of these storms are," Dunn said. "You can’t do a positive campaign if the storm is catastrophic." Arizona generally promotes itself both nationwide and internally, singling out markets each fiscal year from which it wants to increase market share. This year, it set its sights on San Francisco, Minneapolis, Seattle, New York and Chicago, with the Windy City being a perennial target. For next year, it is considering Dallas. If this campaign is successful, Arizona could also expand it to Minneapolis. Agencies Nomadic, Magentry, and Mulberry & Astor worked on the campaign.